The US Election 2016 is really historic not only for Americans but also for the Indians in USA. 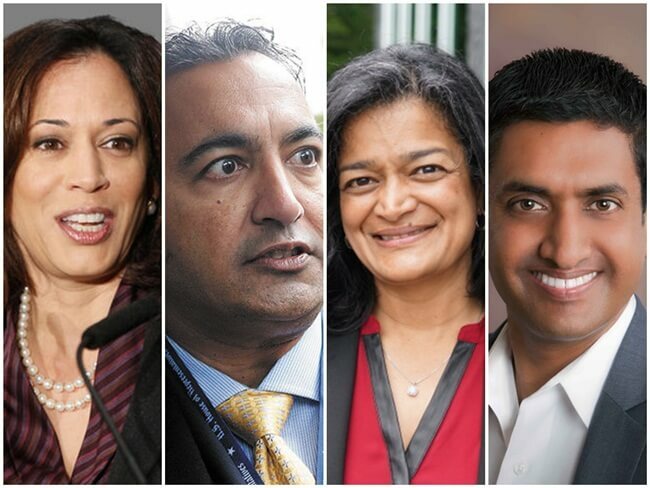 The US Senate has got five leaders from the Indian American community which is equivalent to only 1% of the United States’ total population, according to the 2014 US census. For the first time in the electoral and political history of America, five Indian-origin leaders from different walks of life have got elected to the US Senate in the new governmental regime. Among the five Indian Americans in US Congress, California’s attorney general Kamala Harris became a senator. 52-year-old attorney general Kamala Harris from California scripted history by becoming the first Indian American to get elected to the US Senate this US Election 2016. She is an Indian American with her maternal roots lying in Chennai and an African American on her paternal side. She is often referred to as the nation’s top cop for being the attorney general of California, the largest state of USA by population. She is ‘brilliant, tough and fearless’ according to President Barack Obama. Born in Oakland and brought up in San Francisco Bay Area, Kamala Harris is expected to take the US-India relationship to the next level. She was elected twice as the district attorney of San Francisco in 2003 and 2007. She is a civil rights activist too and works towards women’s rights as well as immigrants’ causes in the US. One of the Indian Americans in the US House of Representatives, Ami Bera is a known face of American politics. He was a facilitator of Indian PM Narendra Modi’s address to the US Congress and played instrumental in the Indian American movement for the release of Diwali Stamp in recognition of Diwali festival by the US Department of Postal Services. Born in Los Angeles to an immigrant Indian couple from Rajkot in Gujarat and brought up in La Palma, he is a Doctor of Medicine. Ami Bera has worked as the chief medical officer of Sacramento in California. Another Indian American woman in the US politics, Pramila Jayapal belongs to Chennai by birth. The first Indian-origin woman in the US House of Representatives, she is a staunch voice of national immigration from Indian community of Washington. She came to USA and joined Georgetown University at the age of 16. She started her career as Wall Street financial journalist. Then she worked for women’s and immigrants’ civil as well as human rights on state, national and international levels for about 20 years. Pramila Jayapal is the founder of OneAmerica, the largest advocacy organization for refugees and immigrants in the US state of Washington. One of the White House’s ‘Champions of Change’ in 2013, she has championed several causes and campaigns, including 23,000 newcomers’ right to vote in USA, tuition-free community college and likes. Even she had proposed to increase the minimum wage, in the Washington State Senate. 39-year-old Rohit ‘Ro’ Khanna will represent the Silicon Valley, the 17th Congressional District of California, in the US Senate. One of the first-generation Indian Americans in US Congress, he was born in Philadelphia and graduated in economics from the University of Chicago. His grandfather, a freedom fighter in the independence movement of India, initiated him into public service. His inclination towards politics resulted from his interaction with Barack Obama during the latter’s 2004 campaign. A staunch advocate of digital economy, Ro Khanna believes in the potential of new-age manufacturing for the economic progress of America. Raja Krishnamoorthi from Illinois is one of the five Indian Americans in United States Congress. Born in Delhi, he came to Illinois when he was a toddler. Brought up in Peoria, he studied mechanical engineering at Princeton University and graduated in law from Harvard Law School. A protégé of President Barack Obama, he worked in the 2004 campaign for the US Congress. He also acted as Special Assistant Attorney General and Deputy Treasurer of Illinois. A tech-savvy small entrepreneur, Raja Krishnamoorthi is a cofounder of InSPIRE, a non-profit organization that trains students and experts in solar technology. Among the Indian American democrats, he is an ardent advocate of the policies to help working families get paid leaves for sickness and maternity. He also campaigns to make colleges more affordable for students from the middle-class income group.